An absurdly long break in posts. Blogs are like new friends – so long as you see each other all the time it’s very comfortable and you get along fine, but if the phone goes cold even for a short while it just feels a bit awkward to pick it up again. Next thing you know, you haven’t spoken in six months and you’re little more than strangers. Anyway, I digress. I’m in the office. It’s a slow day. The bit of newspaper I’m responsible for filling has been filled instead by adverts, leaving me free to look at Twitter (another friendship gone cold) and make an awkward rapprochement with the Cellar Fella. So what was so important that it forced me to ignore this slight social chill and reignite our little relationship? The discovery, no less, of a new thing. OK, it’s not the most revelatory discovery, but it’s new to me. Chenin blanc has been one of those subjects that are just a bit too big. Like rosé, which I almost never drink and absolutely never buy because I just don’t know how, it’s been a bizarre, big gap in my vinous knowledge. But then I went to a wine-tasting dinner (I’d call it a wine-drinking dinner, to be more precise. There weren’t that many wines tasted and they were served in such generous quantities, things swiftly got out of hand) at High Timber on Monday, a charity thing in aid of Cosmic. They didn’t really tell us what we were drinking most of the time, but it was all South African and a lot of it was excellent – a zappy sauvignon blanc, a delicious noble-rot boosted sweet. The restaurant is co-owned by Gary and Kathy Jordan of South African winery Jordan wines, who hosted the evening, so they presumably had a hand in the selections. 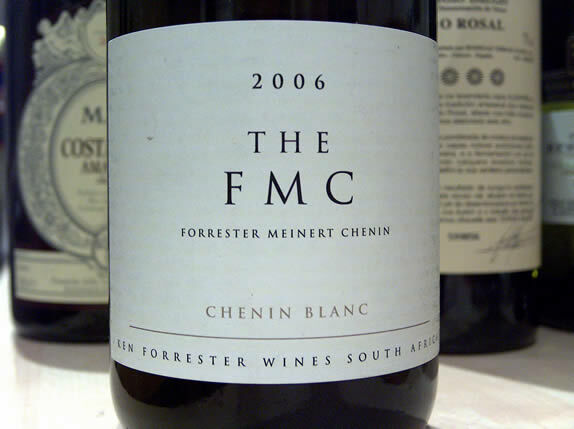 But I really loved the chenin – The FMC, by Ken Forrester – which was as mouthwatering a white as I’ve had for a long while. Then again, it was by all accounts pretty much the best the country can muster. At about £17 a bottle it should be good, but damn, it was. More investigation required. And it’s good to be back. More soon. And apologies for shamelessly stealing the photo from Jamie Goode’s blog.